Announcing an intensive two-day batik workshop in San Francisco at The Language of Cloth Studio, 650-A Guerrero St. on Saturday and Sunday, February 18th and 19th, 2017, from 9 to 4pm. As a young woman Bu Dalmini organized a group of women to rebuild a thriving batik home industry in Klaten, Central Java near the ancient temples of Prambanan that was destroyed by a devastating earthquake in 2004. 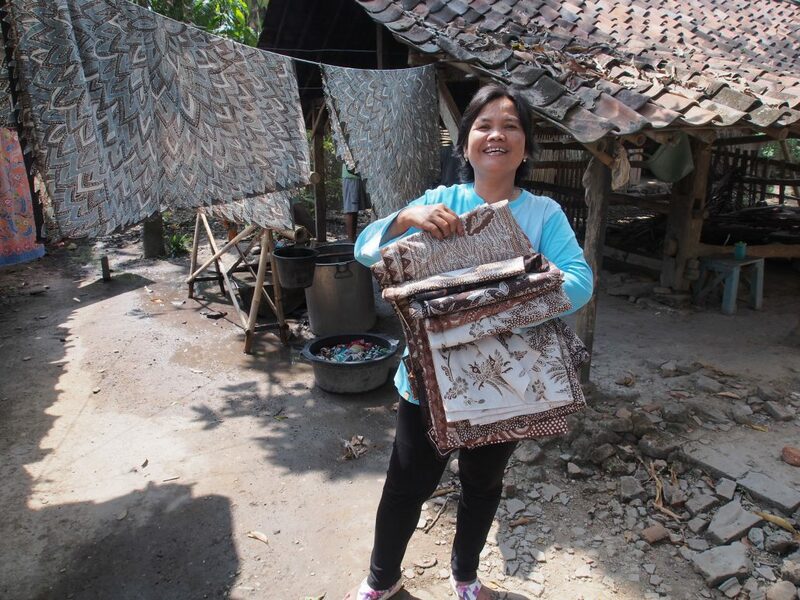 She is a skilled artisan steeped in the tradition as well as a dedicated and respected community organizer who has taught adults and children all over Java to appreciate batik and to develop the skill to make it. 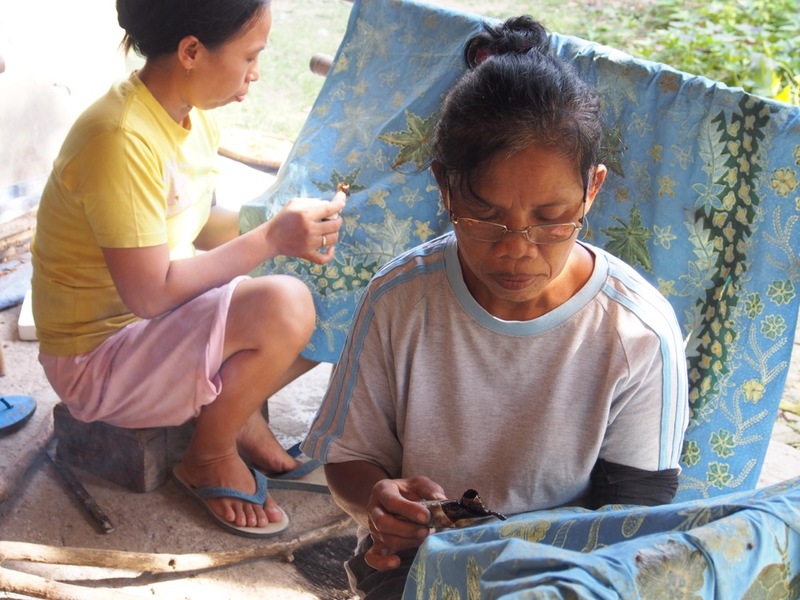 She founded and directs Kebon Indah, a thriving collective of 169 batik-making women from 5 villages. The secrets of batik-making have been passed from mother to daughter for centuries and Bu Dalmini has been sharing those secrets with beginners in schools and villages throughout Indonesia for the last 10 years. She will be in the Bay Area during the month of February 2017 giving presentations at the Tribal Art and Textile Show at Fort Mason, the Center for SE Asian Studies at UC Berkeley, and the Indonesian Consulate of San Francisco. 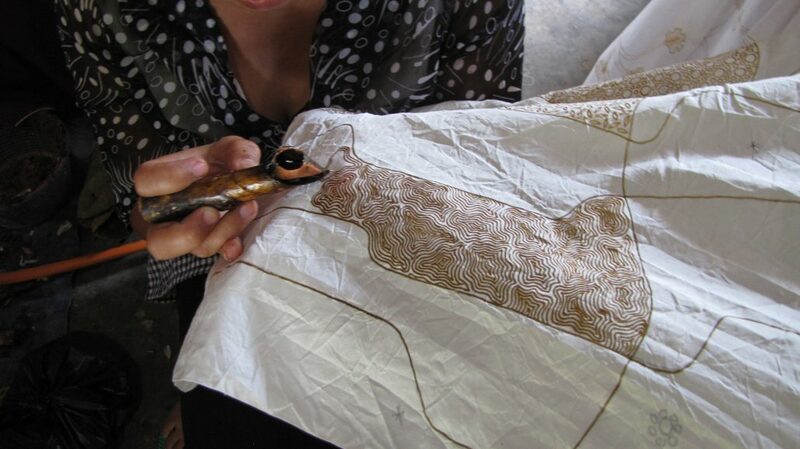 She will be assisted by Daniel Gundlach who has been producing batik for The Language of Cloth for over 15 years. Basic techniques for applying wax to cloth using the traditional Javanese tjanting or wax pen. Temperature and composition of wax. Composition planning and sequence of wax and dye applications. How to dye batik in an indigo dye–bath, over-dye with other natural dye colors, and how to apply color using a brush, coletan. How to remove the wax. Participants will apply these new skills to create their own composition from start to finish. Course fee for two-day workshop $275. Maximum participants 8 persons. All materials provided. Click here to sign up via our online store.